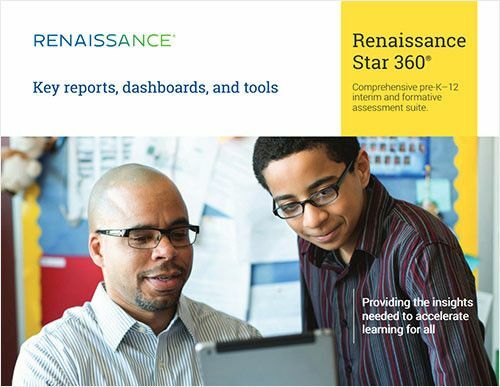 Coming soon, you will notice enhanced reporting capabilities for Renaissance Star 360®. Check out the refreshed, modern look to these updated reports. Star Screening reports show the distribution of students in a class according to State, District, or School benchmarks. Run this report in the fall to determine a baseline, and then periodically throughout the year to track student achievement. Use the goal setting functionality in the software to set up appropriate and attainable goals. Then monitor student progress throughout the year to see how students are performing in relation to their individual goals. Goal line and trajectory toward that goal makes it easy to determine if students are on target to meeting their goals. Make modifications to goals or intervention, as needed. Provides a summary of students’ scores including Scaled Score (SS), Percentile Rank(PR), Grade Equivalent (GE), Normal Curve Equivalent (NCE), Instructional Reading Level (IRL), Zone of Proximal Development (ZPD) and a distribution summary of PR, GE, and IRL scores. See how students are likely to perform on your state summative assessments using the State Performance report. It is suggested to run this report periodically throughout your year prior to your state summative assessment so you have enough time to better influence student outcomes. The Star State Performance Report can be generated for the individual student or class. The Growth Report shows both achievement (Scaled Score, Percentile Rank) and growth scores (Student Growth Percentile). Achievement indicates whether performance is below, above, or on par with grade-level expectations. Growth explains shows the progress the student is making over time. Run this report periodically throughout the year to track student achievement and growth. This report allows you to see the change between two testing events and highlights the test scores that contribute to the SGP. Mastery Dashboards display student level of mastery of state standards at the domain, standard, skill, and subskill levels. Track student mastery throughout the year to get deeper insight into what skills the student has mastered and which skills need further attention. Projected scores are also indicated on this report. Parent reports available in English and Spanish for Star Reading, Star Math, Star Early Literacy, and Star Custom provides a summary of student performance and a brief definition of scores. Indicates the skills students are ready to learn next based on their placement in the learning progression. Dashboard overviews in reading and math provide a wealth of information all in one place. View student achievement toward state, district, or school expectations and track growth within the school year or across multiple school years to help determine if students are on the right path. The Diagnostic report provides assessment data for individual students. It helps teachers identify areas of students’ strengths and weaknesses. The report includes such scores as Scaled Score (SS), Percentile Rank(PR), Instructional Reading Level (IRL), and Zone of Proximal Development (ZPD). Also included are Domain scores. Domain scores, which range from 0-99, are proficiency estimates that indicate the likelihood that a student would be able to correctly answer questions in that domain. * ZPDs are not reported for Star Reading Spanish, Star Math Spanish, or Star Early Literacy. The Item Response Dashboard view shows you which responses were chosen on student assignments for Multiple Choice questions and Constructed Responses questions. Domain Mastery Percentage – Using data from Star 360 computer-adaptive assessments, the Domain Mastery Percentage view shows level of mastery at the domain level for a specific grade. Standards Mastery Percentage within the Domains shows the level of mastery for a specific standard. You can also drill down to the student level to view individual student’s level of mastery. This view uses Star computer-adaptive data and data from Star Custom to provide a 360 degree view of student mastery. 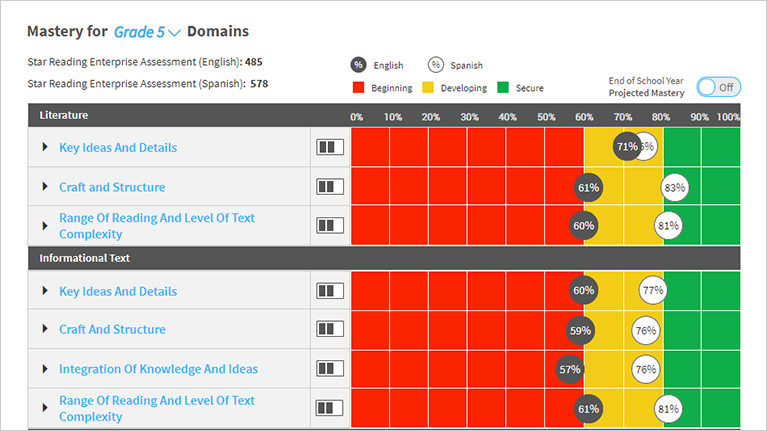 Review Students Results view provides teachers with their students’ results on skills and assignments. The assignment/assessment page allows you to view a list of assignment results. You can also drill down to view results for all students, or drill down further to view all results for one student.